The New York Times is reporting, what we already know–the number of complaints about metal-on-metal hip implants is surging. And there is no end in sight. “All-metal replacement hips are on a trajectory to become the biggest and most costly medical implant problem since Medtronic recalled a widely used heart device” in 2007. At the present time, the major problems appear to exist be with the Zimmer Durom and DePuy (Johnson & Johnson) ASR metal-on-metal hip implants. But complaints are surfacing with many brands. Patients are experiencing reactions, believed to be linked to the shedding of metal debris. Unlike traditional hip implants that use a ceramic or metal ball and a poly-vinyl pelvic cup liner, the metal-on-metal components have metal balls and metal cups. Reactions to the metal debris mimmick severe infections and can attack and destroy bone and soft tissue. In the simplest cases, the metalosis causes the components to loosen and after surgical revision, the patients are recovering normal function after revision. However, in some cases, the metalosis has destroyed so much muscle bone and ligament, that normal revision is not possible. These patients can suffer debilitating pain and loss of function. If you or a loved one has had a metal-on-metal hip implant, you should immediately consult with an attorney. Please contact Todd N. Hendrickson at stlmedicalmalpractice.com. 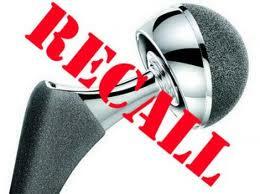 DePuy, a division of Johnson & Johnson, has issued a recall on its ASR hip replacement components, including the ASR Hip Resurfacing System and the ASR XL Acetabular System. You can read about the recall here. 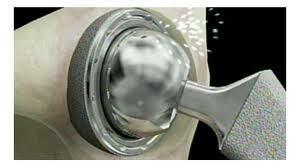 The DePuy ASR components are known as metal-on-metal components. Rather than using a poly-vinyl, ceramic or other material pelvic cup surface, the DePuy, like many other manufacturers, designed the ASR system to utilize a metal ball head and metal pelvic cup. The result is apparently is a disaster. By some reports, more than 13% of these implants are failing within five years. The average him implant lasts 15-20 years before it wears out and needs to be revised. The highest rate of failure is in the smaller ASR implant sizes, 50mm and less, the most common sizes implanted in women. If you have an ASR hip implant that has been revised due to early loosening or other problems, please contact the office of Todd N. Hendrickson immediately. Our office is aggressively investigating these cases and can help you. It is important that you be represented by an experienced medical malpractice and medical product liability lawyer, as DePuy will attempt to defend these cases by claiming that surgeon error in implantation. Don’t trust your case to a so-called “mass tort” law firm that doesn’t prosecute medical malpractice cases. Contact our office today, by clicking on this link.